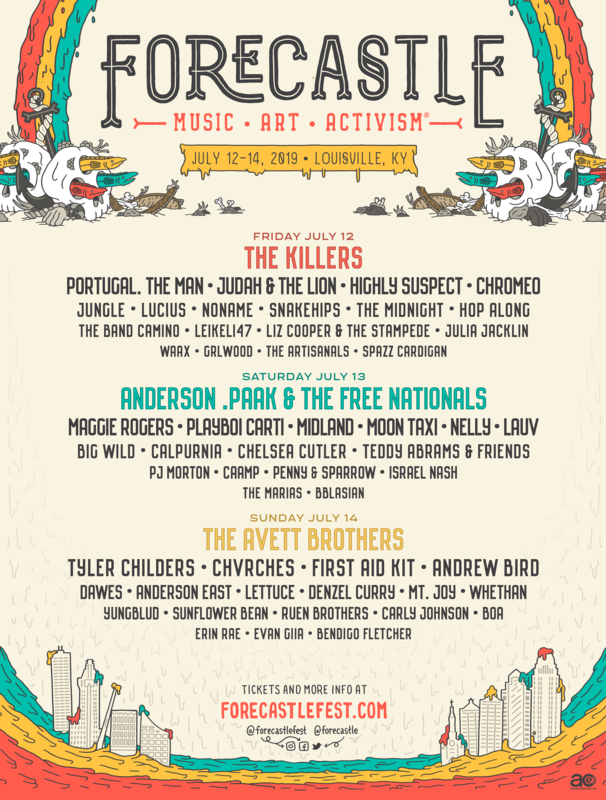 Louisville’s Forecastle Festival has announced its full lineup for 2019. The weekend-long Kentucky festival will feature headlining performances from The Killers, Anderson .Paak & The Free Nationals, and The Avett Brothers. Forecastle Festival will take place July 12-14 at Louisville’s Waterfront Park. Other notable performers at this year’s festival include Noname, Playboi Carti, Maggie Rogers, Portugal. The Man, Hop Along, CHVRCHES, Andrew Bird, Chromeo, Dawes and First Aid Kit, among others. The festival was founded by J.K. McKnight in 2002 as a small community gathering and has since grown to attract tens of thousands of fans from around the world each year. It has featured performances from artists like Jack White, Outkast, The Black Keys, LCD Soundsystem, The Flaming Lips and Wilco. Last year’s headliners were Modest Mouse, Chris Stapleton and Arcade Fire. Check out the full lineup below, beneath a 2008 Avett Brothers performance from the Paste archives.